It’s hard finding earbuds that don't break, isn’t it? …and the reason for buying a new earbud was because the old one broke. If your story is something similar and looking for the most durable earbuds within your budget then this article is for you. Sincerely speaking, earbuds are Godly creation that allows listening music without carrying bulk that headphones offer. Moreover they’re easy to carry and can be stored anywhere, right into your pocket as well. The story doesn’t end there, since they’re lightweight; they’re prone to break easily leaving them useless and non repairable as well. Hence why I’ve hand-made this list of nearly unbreakable in ear headphones that will not only last you a lifetime but also offer great sound quality at affordable price point. 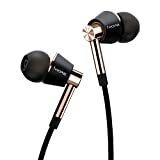 Sony MDRXB50AP is one of the cheap flat corded earbuds in our list of most durable earbuds under $50. 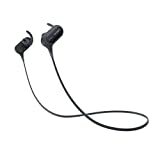 While making this list, I had kept in mind to include only those earbuds that come with either metal or aluminum body, however I made an exception for the Sony MDRXB50AP earbuds as it is built like a tank; even with plastic construction. Though not a looker (compared to other earbuds included in our list of strong earbuds) but it does scores on functionality and ease-of-use. Available in Black, Red and Blue color, the earbud has an unusual angled eartip design with a bass duct for strong low-frequency response. To be honest, these earbuds are meant for bassheads and hence why mids and highs sound recessed. They accentuate bass in every song that you listen to, this can sometimes get irritating if you primarily listen to Rock or Alternative Genre songs. It has a big 12mm driver inside that is capable of loud sound and heavy bass. A larger driver allows the earbuds to push out wider frequencies. You get a no-frills inline microphone, which offers only Play/Pause and Call Receive/End functionality. I personally love the fact that you can keep these earbuds in whatever way you want and still they won’t get damaged. 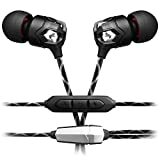 These heavy duty earbuds win by a larger margin when it comes to built quality compared with other plastic-made earbuds in similar price category. Sony MDRXB50AP happens to be the most sturdy headphones made up of plastic in the affordable audio segment. "If your main motto is to listen Electronic, Hip Hop & Rap songs, and are careless regarding your earbuds while happen to be on budget, trust me Sony MDRXB50AP won’t disappoint." 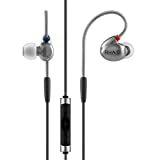 Fiio, a brand that is specifically known for producing budget and high quality audio amplifiers and DACs has now come up with its first in-ear headphones. And guess what? The brand hasn’t gone wrong and the earbud has made its mark just after its launch. One thing I’d like to mention is, the Fiio EX1 is a custom version of Dunu Titan 1 and hence why Fiio has preserved the Dunu branding on its earpiece. Since they’re built with a full body metal construction and Kevlar reinforced cable; makes them the Best Durable In Ear Headphones under budget. The earpiece is made up of anodized duralumin at the back and stainless steel construction at the front, with high purity OFC copper intertwined with 250D Kevlar fiber strands. Such kind of built quality ensures a super long life and resistance from everyday’s wear-and-tear. However one complain I had with the Fiio EX1 is it doesn’t stand out when it comes to design nor does its looks feel desirable, but that’s my personal opinion after all. Coming to the sound quality, most reviewers out there claim it to be the best earbud under $100 price range as it has an almost hi-res sound that can beat competitors double or triple its price thanks to its 13mm driver. However I felt the highs to be harsh at times and slightly recessed mids, though nothing extreme that can put off its value-for-money price tag and performs majorly better than earbuds in similar price range. Though the packing doesn’t even stands up to a Soundmagic ES18, but the content inside make up for it; as it includes 9 eartips of different size and material, a hard carrying case (I liked it very much) and a shirt clip as well. 1More Triple Driver is my personal favorite earbud compared to all earbuds mentioned in this list and also featured as best earbuds under $100. Though the styling resembles to some of Sony angled earbuds, however other than the design, they’re nothing like Sony Earbuds. One of the better things that this IEM hosts is that its inline 3-button microphone is compatible with iOS and Android Smartphones, giving it an edge compared to other earbuds in our list. To make the deal sweeter, the brand has included ton of accessories in its package. 1More Triple Driver box contains, 6 silicone eartips along with 3 foam eartips of various sizes, a magnetic-clasp leather carrying pouch, aluminum finish shirt clip and an airline adapter. The unboxing experience is premium as well, giving you feel of getting hold of an earbud costing next to $200-$300. Coming to the technicalities, each earpiece holds two balanced armature drivers as well as a single dynamic driver with impedance listed at 32 Ohms. However the exact size of drivers is not mentioned by the company. Just as the brand mentions, the sound quality of 1More Triple Driver is crisp, detailed and offers justice to lows, mids and highs. There’s plenty of bass as well as a strong and tight mid-range supported by a detailed and warm highs. It’s definitely a boon for audio enthusiasts who don’t want to put too much cash into getting a high-value earbud at decent price. One thing I do want to mention is that these earbuds; due to its shape and size aren’t an ideal earbuds if you plan to take them during intensive workout routine or running. "This is why these earbuds are my personal favorite even though they don’t come from an household brand or promoted by a famous celebrity." To build the best durable IEMs, where most manufacturers go with an aluminum or stainless steel construction, VModa has gone a step further and built their ‘Zn’ in ear headphones using Zinc alloy with its patented process. VModa though has very few audio products under its belt, however it has become a household name in the premium audio segment, and VModa Zn is no exception to that name either. Though it comes with a fairly hippie and outcast kind of design, the VModa Zn is a durable in ear headphones that isn’t cheap but fairly gets the job done. Just like the earbuds themselves, the package is of high quality as well, since you’re spending close to $200 on a single earbud, you do expect to get a premium unboxing experience as well and VModa Zn package offers just that. Out of the box, the package includes the VModa Zn earbuds themselves along with 3 set of black colored silicone eartips, turning the package around, there’s a small compartment behind it that has the magnetic-latch leather carrying pouch. The earbuds comes with two versions: one with a 3 button microphone for iOS, whereas the other one with a single button inline mic for Android smartphone. The leather pouch includes further accessories like: 4 extra transparent silicone eartips, a shirt clip and snap-on flexible ear hooks that enables you to wear the Zn from behind your ears as well during intensive workout and active sessions. Though the brand claims these earbuds to be of audiophile grade i.e. having neutral sound and flat response, the Zn does give slight emphasis to the lower frequencies (bass) that does make the listening quite enjoyable for such a good durable earbuds. "To conclude, the VModa Zn ticks all the right boxes, with a plausible design. strong built quality, great sound and a rcok-solid cable to cap it off." When it comes to building the indestructible earbuds, RHA has been a top-notch name with all its earbuds coming with a metal construction or high quality plastics. RHA T10i is no exception either to the brand name and one of the best built earbuds you can find right now. There’s no question that RHA T10i are the most sturdy in ear headphones in our list, however one thing that does stand out is that these earbuds are made of metal injection-moulded stainless steel material giving them a tank-like build quality and makes them look beautiful as well. Well aren’t just the earpieces build to last, the high strength design carries along with the cable, with the inline microphone and reaches to the 3.5mm jack as well, making them the best durable earbuds that can last a lifetime. Another stand out feature that these earbuds hosts is that it comes with interchangeable acoustic filters. This means, the T10i package comes with three different filters called: Bass, Treble and Neutral, and its sound signature changes as you change the filters. A feature like this allows you have complete control over the kind of sound you get. The bass filter is great for bass heads that listen to songs from genres like Pop, Hip Hop, Rap and so on. The treble filters puts emphasis on genres like rock, acoustic, heavy metals and so on, while the Neutral filter offers a flat frequency response. What’s more interesting is its package! Let’s see what’s inside the box: Shall we? It comes in a nice package that contains 10 eartips of different shape, size and material, along with a nice premium earbud storing wallet and the three acoustic filters. 1. Earpiece Build Quality: It’s no secret… if you want a strong in ear headphones, you got to go for IEMs that are built out of Aluminum, Stainless Steel or any other strong metal alloy. Compared to plastic earbuds, metal earbuds have the ability to take a fall or two and can stand against everyday wear and tear that most plastic-build in ear monitors lack. Though it doesn’t justifies that every metal built earpieces are durable. Previously I owned Brainwavz Delta IEMs that had metal housing, however just within two months of regular use, both the earpieces split; rendering the earbuds as a whole unusable. Though I tried sticking them with glue, but was of no use. Moreover it doesn’t means that all plastic built earbuds are prone to damage. To give a real life example, I owned Cowon EM1 earbuds that were built of high quality plastic and rubber, and lasted with me for slight over 18 months until I lost them in my house. Likewise plastic-built earbuds from Bose; happen to be durable as well. 2. Cable Wire: Do you know what's the main reason why most earbuds breakdown? Most earbuds I owned that broke down were due to the fact that inside cable wire tend to break either at the earpiece or towards 3.5mm connector. However since most of them were cheap IEMs, I wasn't too saddened about them because they paved way for new earbuds instead. Coming to the point, cables are an integral part when it comes to earbuds durability, longevity and sturdiness. Even the most cheap earbuds these days come with braided cables that not only offers durability but also provides tangle-free design as well. If you’re not fan of braided cables (like me), then another option to look for is Kevlar built cables. Kevlar is a material used in bullet proof vest and is one of the lightest and strongest material out there. Additionally you don't need to spend much on such earbuds, as Kevlar reinforced earbuds like the JLab Audio J4 are easily available under $35. Even earbuds from generic brand with Kevlar cable cost as low as $10.